Burial location: Sage War Cemetery, Oldenburg, Germany. 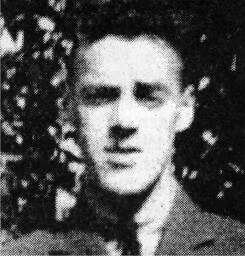 Pilot Officer John Douglas Hogg was the son of Harry D. Hogg and Addie Jean Kirk of Lot 8 Concession 9. Educated at Thamesford Public School 1928-34 and the Thamesford Continuation School 1934-1939, he completed Grade 13 at Sir Adam Beck School in London. After leaving school, he was employed as a blueprint chaser for the Charles Morrow factory in Ingersoll, a trucker for Massey Harris Limited of Toronto and a tool chaser at John Inglis and Company in Toronto. Douglas Hogg enrolled in the Royal Canadian Air Force (RCAF) in London on August 11, 1942. He completed recruit training at 1 Manning Depot in Toronto and on October 24, 1942 went to 14 Service Flying Training School. He was posted to 4 Wireless School in Guelph on December 28, 1942 for training as a radio operator. On August 7, 1943 he was transferred to 4 Bombing and Gunnery School at Fingal, Ontario and on September 27 he went to 4 Air Observers School at London, Ontario. On February 26, 1944 Sergeant Hogg was posted to 3 Air Gunnery Training School at Three Rivers, Quebec to complete his training. Hogg sailed to England on March 25, 1944 and arrived there April 3. After a brief pause at 3 Personnel Reception Centre, he was posted to 6 (Operational) Advanced Flying Unit on April 18, 1944. On May 30, he was transferred to 22 Operational Training Unit where he was placed in an operational crew. On completion of training at 22 Operational Training Unit, Sergeant Hogg and crew were then trained on the Halifax bomber from September 4 to October 3 at 1664 Conversion Unit. Finally, on October 3, the crew was posted to 432 Squadron. On October 14, Sergeant Hogg was promoted to Pilot Officer although it would appear that the promotion was approved retroactively and that Hogg knew nothing about it. On October 15 at about 5:30 p.m. they took off in Halifax NP723 as part of a mass attack on the German naval port of Wilhelmshavn. German night fighters were active and in the early evening his aircraft was shot down near Wittmund, Germany. Pilot Officer Hogg is buried in the Sage War Cemetery in Oldenburg, Germany. He was predeceased by his father and survived by his mother, sisters Norma, Doris and Jean. brothers Ronald and his twin George. -- Courtesy of St. Marys Journal Argus.